The edge of the track southeast of Bayreuth is clearly visible. 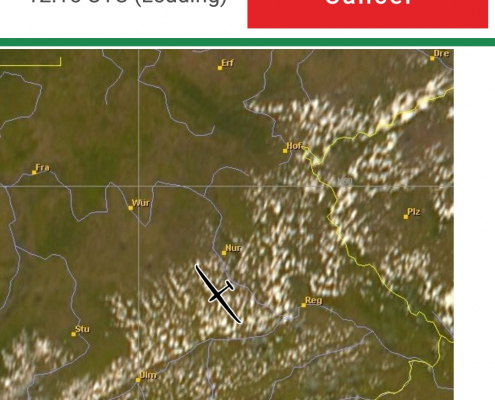 TopMetSat shows the developed line from a position near Roth. Before I took a shortcut through the airspace Charlie of Nuremberg. Munich Radar: “D-Kilo triple uniform, make sure you stay above FL65 ;-)”. The Danube valley rewarded me with a really beautifully developed line. I was able to follow it from Donauwörth to the Beuron monastery, with a 60′ average of 140 km/h.